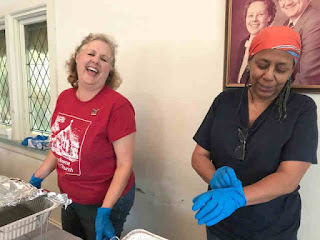 Thank you to all the volunteers (our chefs, our greeters, our servers, our advertisers, those who set up and those who took down and cleaned up) who made our delicious pancake breakfast happen. Thank you to the community who generously showed up, contributing to our Aaron Royal Scholarship Fund. 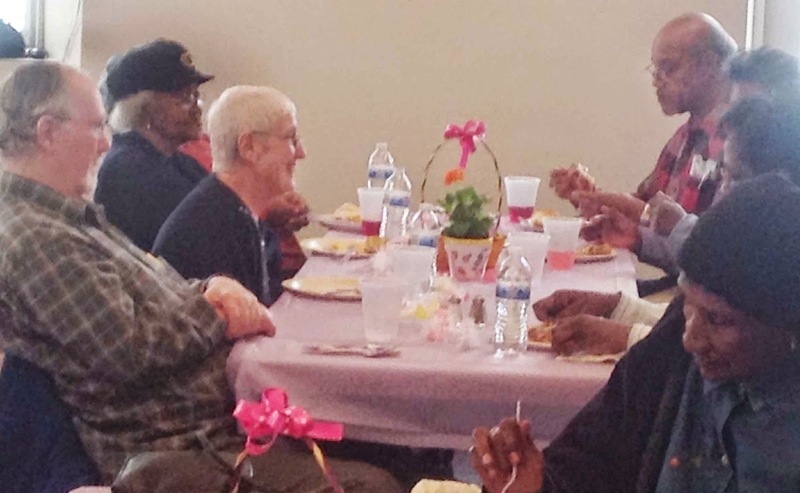 It was an enjoyable time of community fellowship, and a delicious one as well. 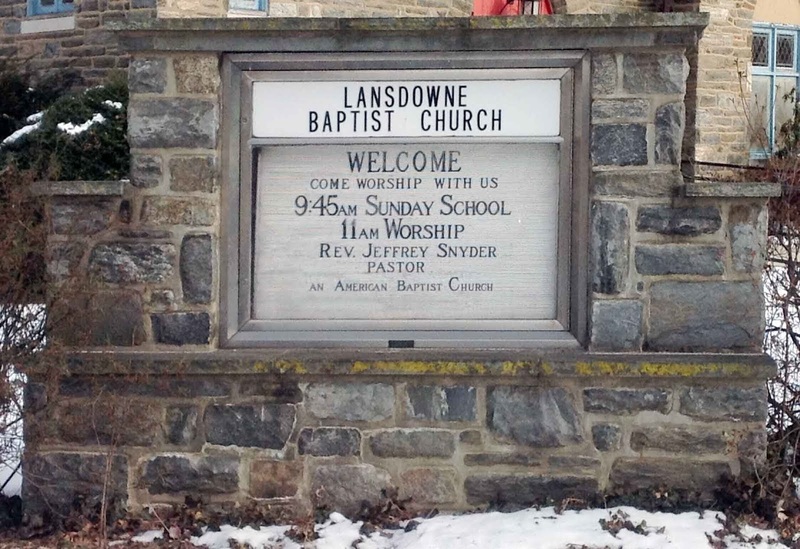 Lansdowne Baptist Church, 17 East Lacrosse Ave., Lansdowne, PA, is preparing to hold its annual Feasting with Friends event. It will take place on Saturday, March 17, 2018, from 12:00 to 2:00 p.m. at the church. This annual event has always been a success and we are hoping and praying that it will be even better this year. We ask that you come and join us as we feast with friends. You may contact the church at 610-626-0637 and let us know who you are and how many people are coming in your group. We look forward to hearing from you and sharing God's blessings with you, with the meal and an inspirational message. Join us, friend. Members and friends of Lansdowne Baptist Church, join us Wednesday night, November 1, 2017, in Westphal Hall for a potluck dinner and visioning for our future together. This will be an exciting meeting discerning where God is leading us now. Come and give us your vision for our future together. 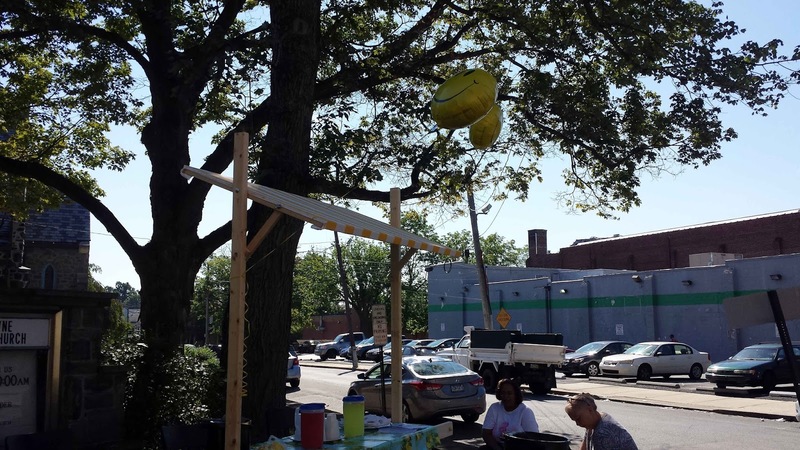 Shortly after 5 p.m., the LBC spot was set up on Tuesday, August 1, for the National Night Out. We had church volunteers to help, church members who stopped by to chat, and interested community members who came by, learned a little about us as we learned a little about them, and took away both information and coloring books. Thanks to everyone who helped and all who showed up. You were a blessing from God to us. God gifted us with a beautiful, if mighty warm, evening. The crowd was friendly. The food was terrific. 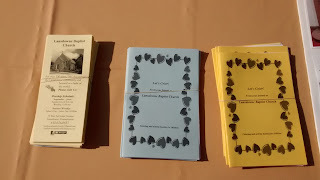 And our Presbyterian neighbors were wonderful, as always. An enjoyable evening was had by all. We also were introduced to the police departments newest recruit, the K-9 unit member, a young and very eager German shepherd. Sorry for the lack of people pictures. My phone failed right after these photos were taken! Look forward to seeing you at next year's event. End of School Year Bash Was a Blast! 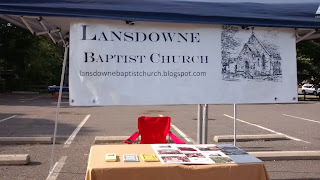 Lansdowne Baptist Church kicked off our summer season with our annual End of the School Year Bash. 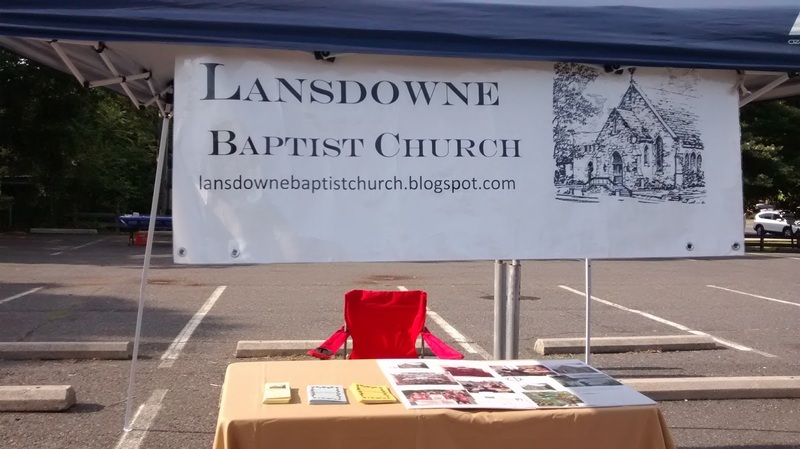 We had a great deal of fun with our congregational family, friends, and neighbors (just so you know, when LBC holds an outdoor event on our most wonderful piece of property--the lawn at the corner of Lansdowne and East LaCrosse Avenues, you are invited to join us there). The day started off with a brand new project, our youth raised bed vegetable and flower gardens (it was three beds that day, but due to God's abundance and the powerful movement of His Holy Spirit, we now have four beds). The children and youth planted our vegetables in anticipation of the coming harvest. 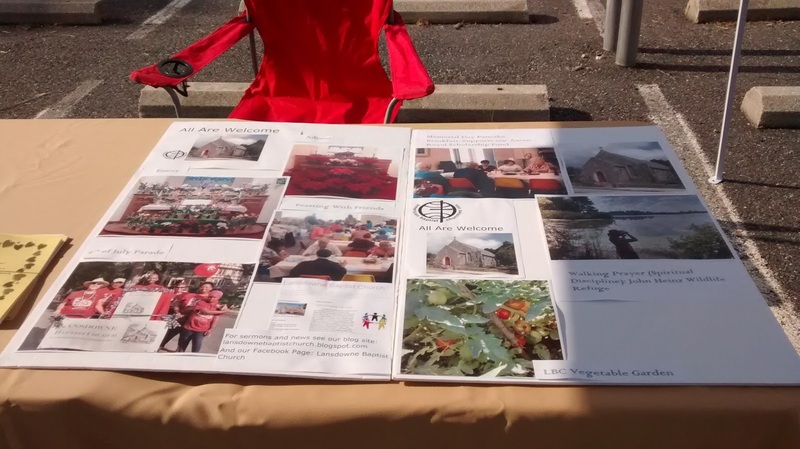 We plan to share the produce with our kids and the local Interfaith Food Cupboard this fall, God willing. 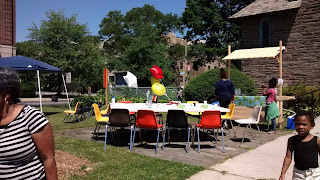 We had lunch using our locally famous lemonade stand. 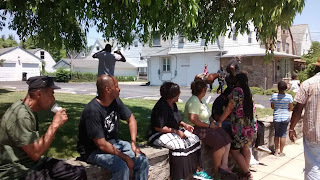 Then the pastor did a little Christian clowning and discovered the fun of involving more of the audience in the performance. 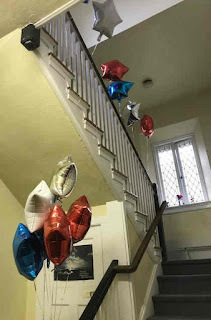 This was followed by some terrific games (the flying disc toss trying to ring traffic cones was particularly popular with kids and adults alike). 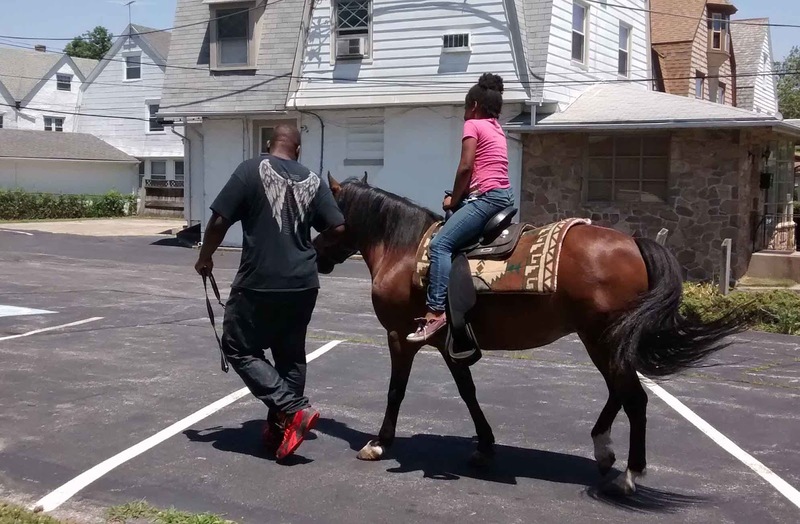 Then came our next new event, a pony ride for the kids. Some children were so in love with this event they rode that pony four or five times in the hour she was with us. I want to take a moment to say a great big thank you to everyone who made this event so successful and memorable. All of your hard work and preparation and involvement are greatly appreciated. We could not do this without each and every one of you. It was a blessed day and we look forward to doing it again next year. Who knows what new things we'll have added by that time? Come and find out. You are always welcome. 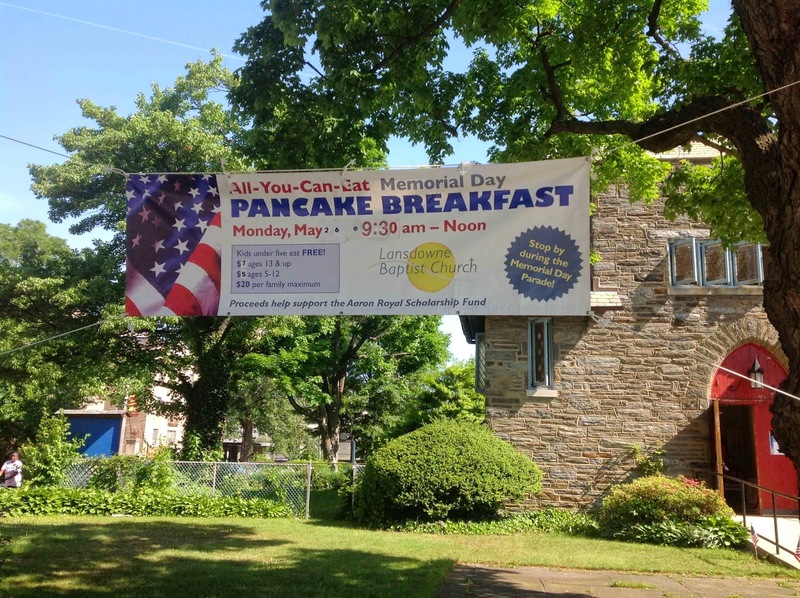 Please join us for our Annual (all-you-can eat) Memorial Day Pancake Breakfast. 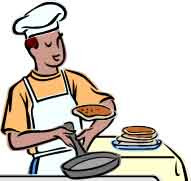 The breakfast will be held Monday, May 30, 2016, from 9:30 in the morning to noon. Admission is $7 per person; $5 for children 12 & younger. This deal is hard to beat. This breakfast is for a good cause (beyond filling your empty self with delicious pancakes) as the proceeds support of the Aaron Royal Scholarship Fund. This fund, when monies are available, is used to provide college scholarship funds for two deserving local high school students. We love to provide these scholarships for our community here at Lansdowne Baptist, but we need to sell a lot of breakfasts to make the scholarships happen. 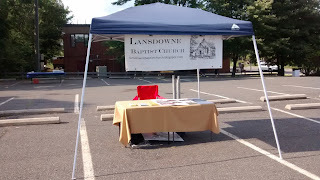 Come join us and keep this wonderful tradition alive in Lansdowne. The LBC breakfast is also a favorite event for runners involved in the LansdowneMemorial Day 5K Race (for more on the race, see: http://lansdownesfuture.org/5k/). We hope to see you here. Exploring the significance of Jesus' miracles of the feeding of the 5000 and walking on the water for today's people. Based on John 6:1-21. Also, the video begins with a gaff ... the projector was not working properly with my remote and I had to make adjustments before I could continue. I considered editing this short gaff out, but emphasize in services that we are not perfect people. While we strive to do well as Christ followers, we do not expect perfection from each other and we accept when things go wrong and move on. Hopefully, you will do the same and be gentle with yourself when you are less than perfect. Wishing you all a blessed day. 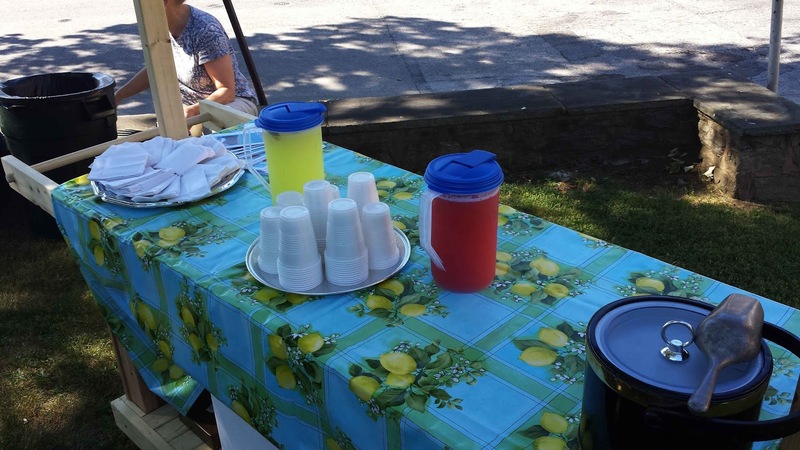 This morning, volunteers from Lansdowne Baptist Church conducted our first lemonade sale. 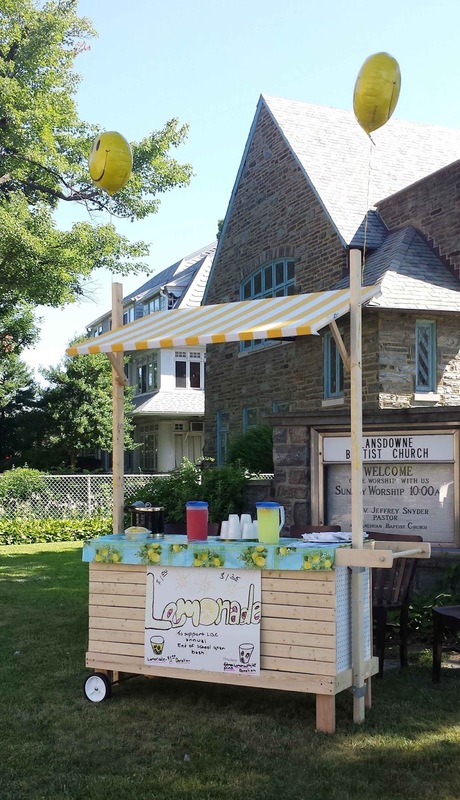 One of our members handy with tools and wood created a sensational lemonade stand on wheels, complete with an awning and space in the back for an ice cooler. 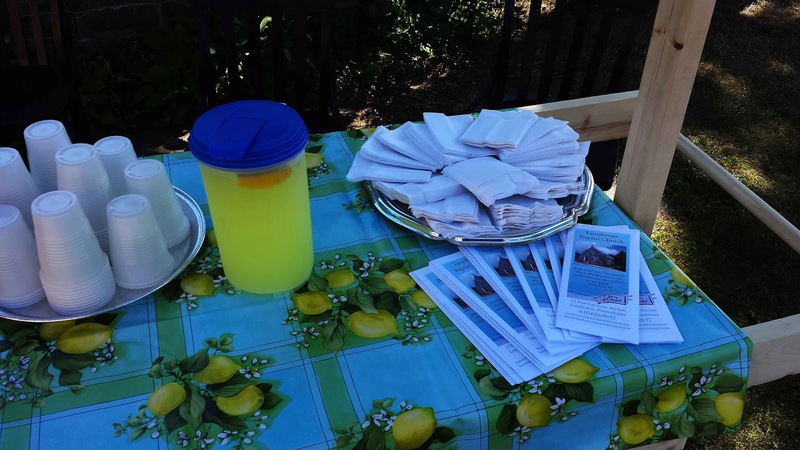 We had both adult and children volunteers who had a terrific time selling lemonade and meeting the community. The weather was ideal and the turnout was great. Many members of our community turned out, curious to see what we were up to. 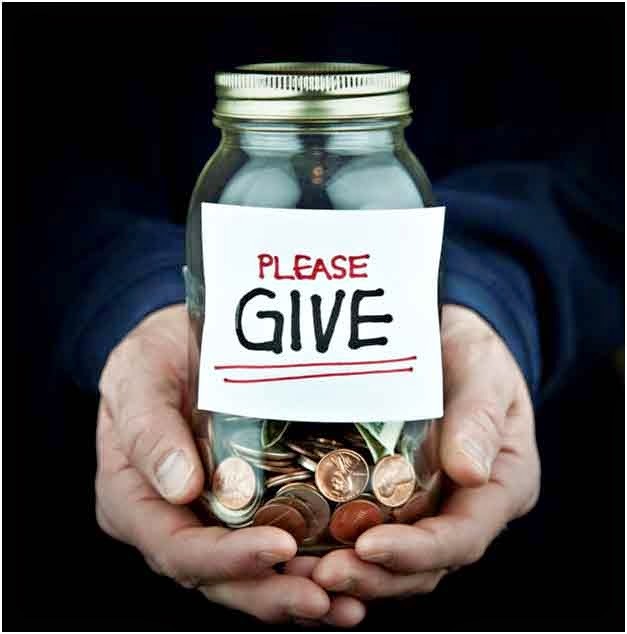 Several generous people provided donations and asked for nothing in return. The lemonade, both regular and pink, sold out by the time the stand closed up at one in the afternoon. 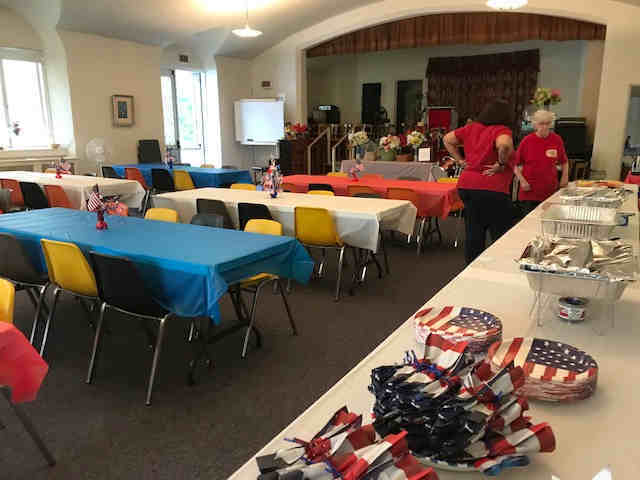 One of our volunteers said of the experience, "The money we brought in doesn't completely describe the positive experience for our church, our kids, our volunteers, and everyone who supported the event. We met some very nice people, many who stopped by to get lemonade but wound up talking with us and the kids about the church." I personally want to thank everyone involved who made the day such a success. We are very glad to have met so many people from our local community and look forward to seeing them again soon. 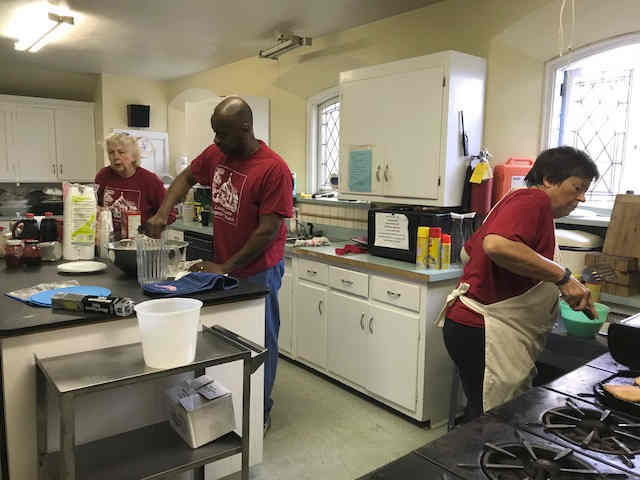 Lansdowne Baptist Church is cooking again ... literally! And we have great chefs. We really do. If you are coming out to enjoy the Lansdowne, Pennsylvania, annual Memorial Day Parade or run in the Memorial Day 5K (see http://lansdownesfuture.org/5k/ for more), you need to stop by Lansdowne Baptist for our annual Memorial Day Pancake Breakfast. 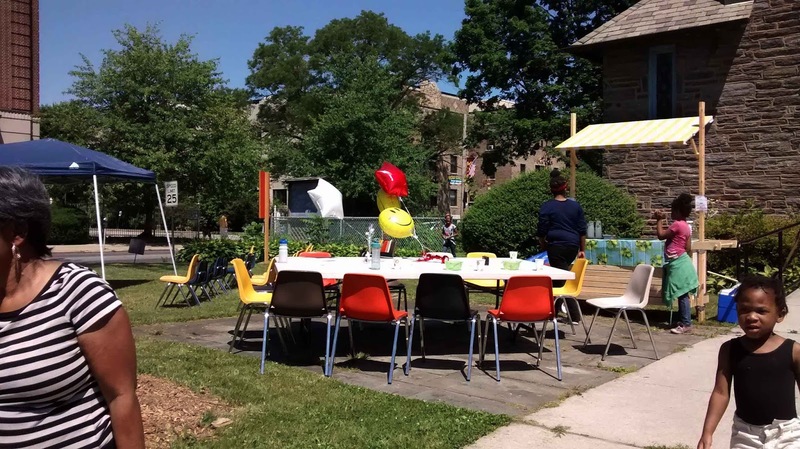 We will be serving up great food from 9:30 AM to Noon on May 25th, so come hungry. The prices are $5 for children ages 5-12; $7 for ages 13 and up; and $20 for families. It is always a good deal. 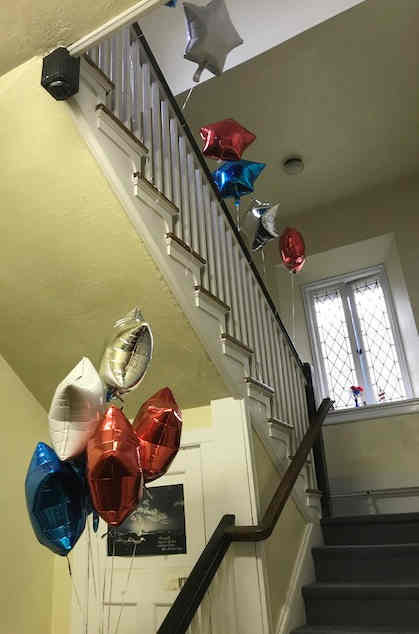 The proceeds help support our Aaron Royal Scholarship Fund, awarded annually to deserving high school seniors heading to college from the William Penn School District or among church families. We love to give back to our community, and this is one delicious way you can help. See you for the breakfast and the festivities. 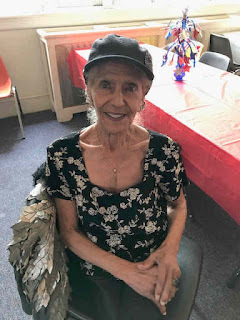 God bless you, your family, and your friends. On Saturday, May 9, our postal carriers are asking people of good will to set out bags of non-perishable food donations by your mail box. The postal carriers will then deliver these much needed groceries to local food banks for prompt stocking and distribution. There are far too many people in the United States currently suffering under conditions of "food insecurity," especially children. These children and their families simply do not have enough food available and, given their stressed circumstances, often do not know where their next meal is coming from. You can help food banks address this dire situation with your donations. Thank you for your support. God bless you and your family. Psalm 133, verse 1, reads, "How very good and pleasant it is when kindred live together in unity!" This annual event reminds me of that verse. 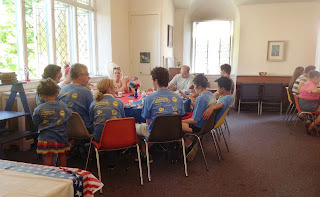 Wonderful volunteers were ready and well-organized to make the experience meaningful as well as hunger satisfying. Contributors had provided enough food to send many home with meals for others. 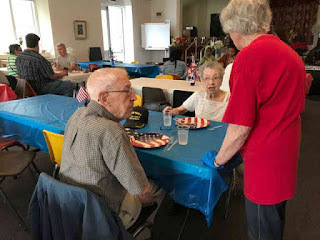 Around 100 friends from around Lansdowne came to dine with us. 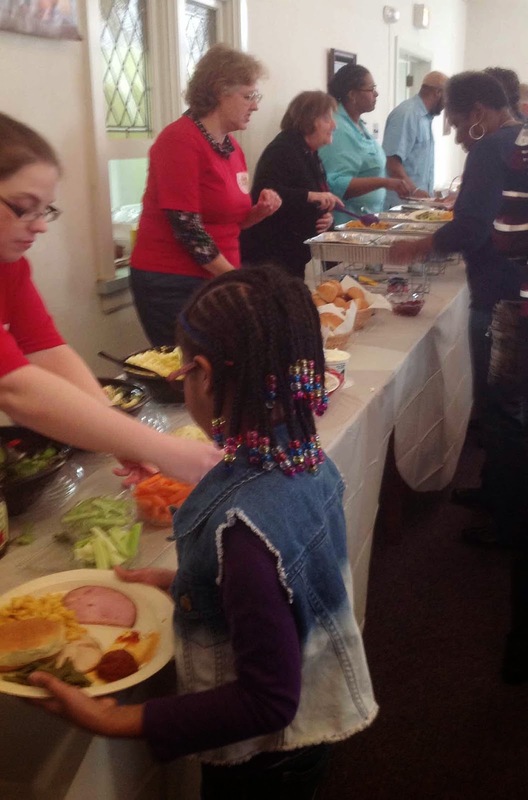 It was a fantastic meal and a great community gathered to break bread together. There are no words to adequately describe the feeling of that warm community. As the pastor, it was my privilege to make a few remarks. Here is a part of what was said. It is like Paul speaking of the body, the membership, in 1 Corinthians said, “For just as the body is one and has many members, and all the members of the body, though many, are one body, so it is with Christ. 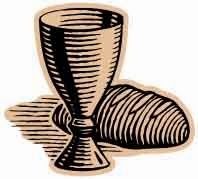 For in the one Spirit we were all baptized into one body--Jews or Greeks, slaves or free--and we were all made to drink of one Spirit.” Today, in this body, we are many members with different talents, different backgrounds, different histories, and yet here we are one community, for a short time at least. If we combined all those talents and worked as one, imagine what wonderful things we might accomplish. ... Today, we are touching each other’s lives here in these all too few hours of food and fellowship. It is a beautiful thing, a wonderful moment, a real gift from God. I am glad you all came. This is also a small hint at a prayer Jesus himself made to God for his disciples, and by extension, for us all. Jesus prayed, “I ask not only on behalf of these, but also on behalf of those who will believe in me through their word, that they may all be one. As you, Father, are in me and I am in you, may they also be in us, so that the world may believe that you have sent me. The glory that you have given me I have given them, so that they may be one, as we are one, I in them and you in me, that they may become completely one, so that the world may know that you have sent me and have loved them even as you have loved me.” It is a beautiful prayer, that one day we might all be one. We are not there yet, but meals like this certainly do not hurt. It reminds me of the book of John in which God loved all of humanity so much God send Jesus to tell everyone, everywhere that this is true. So, let me end with a broad statement for everyone here, no matter your background, no matter your history, no matter your faith, I say to you, you are the beloved of God. It has been very good to break bread with you today. I hope you have found this experience to be a blessing. I know we here at the church have. When you leave here today, may you go in peace and be a blessing to everyone you meet. Who knows what communities you might create and what amazing things you’ll accomplish together? It was a wonderful time of fellowship. We look forward to repeating the experience again next year. We hope you will bless us with your presence so we may break bread and enjoy community together in 2016. 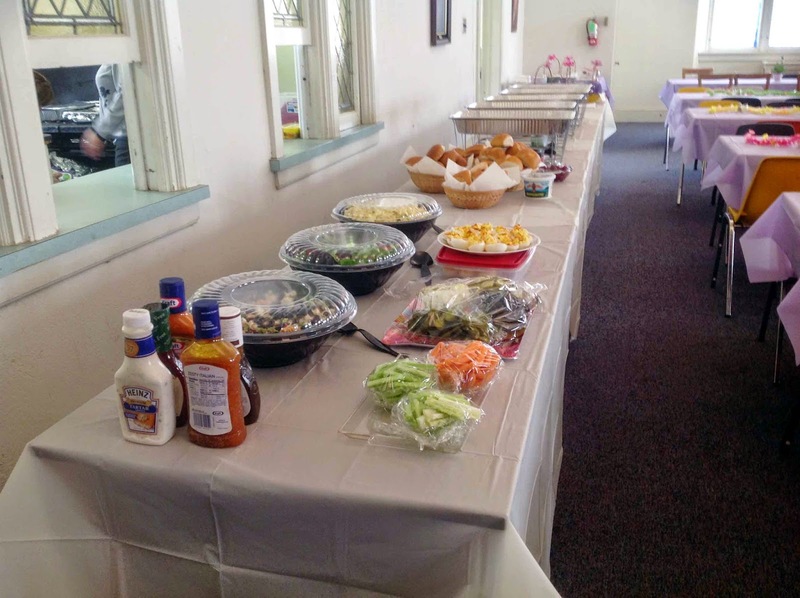 We'll save a place at the table for you in 2016! 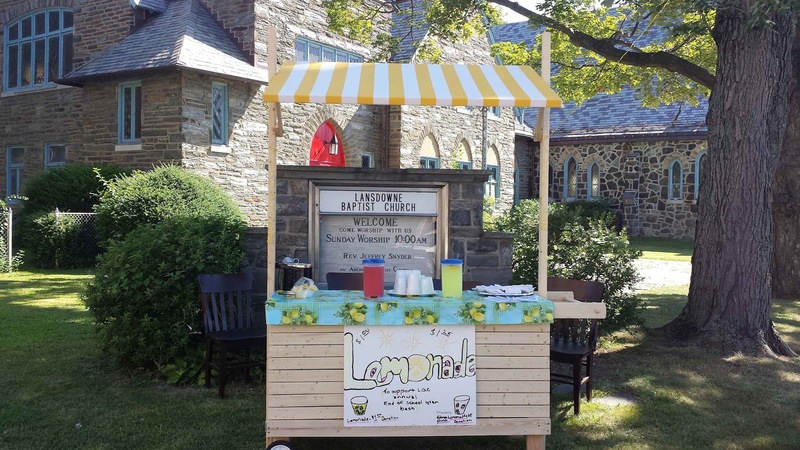 Lansdowne Baptist Church, located at 17 East LaCrosse Avenue in Lansdowne, PA, will be holding its annual Feasting with Friends event again. 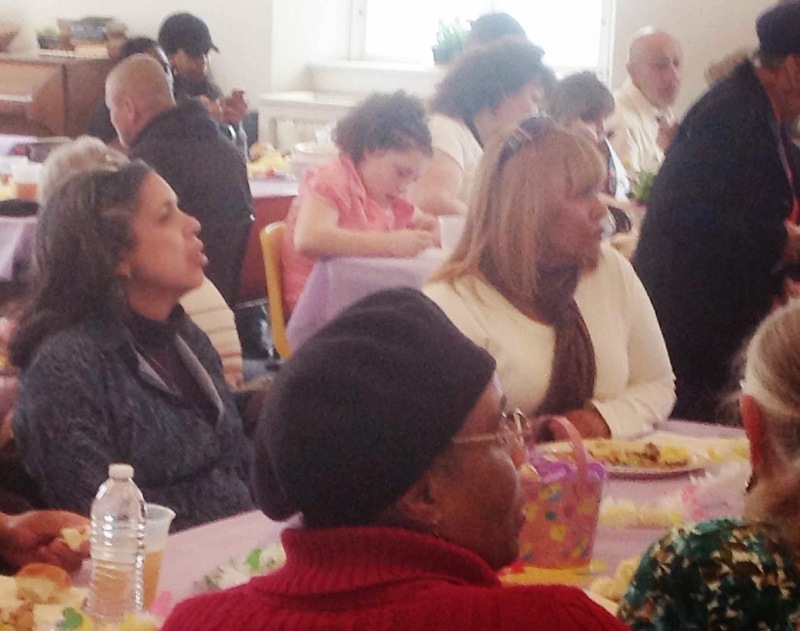 This well attended and welcome event will take place on Saturday March 21, 2015, from 1:00 PM to 3:00 PM at the church. This is a time to break bread and share a good, home-cooked meal in a wonderful, loving atmosphere. Come out and visit with old friends and new. All are invited to join us and enjoy in God’s bounty. If you are interested in either contributing to this worthy cause or attending, please contact Joslyn Banks at 215-898-7589. There is absolutely no cost for attendance. However, we will need to know how many are in your party/group. We are looking forward to the blessing of feasting with you. The holidays are difficult times for those in need. 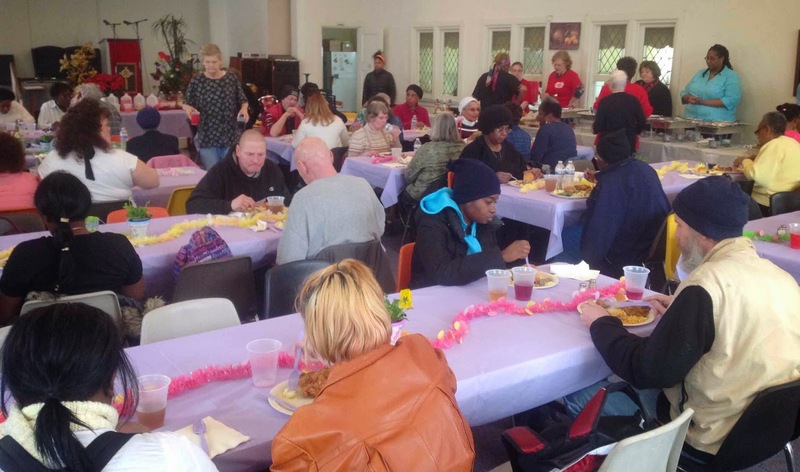 Here are a few of the organizations in Philadelphia helping to make a difference for Thanksgiving day, 2014. Check them out and see how you can help ... or be helped. If you are struggling this year, our prayers are with you. With God, you are also never alone. Working with one of these organizations to help alleviate hunger may well be a better use of our time than heading to stores on Thanksgiving day. We gave each a nine meal supply of food (three days), so we provided 3078 meals!! WE NEED lots more food—so if you can help, we would be grateful!! 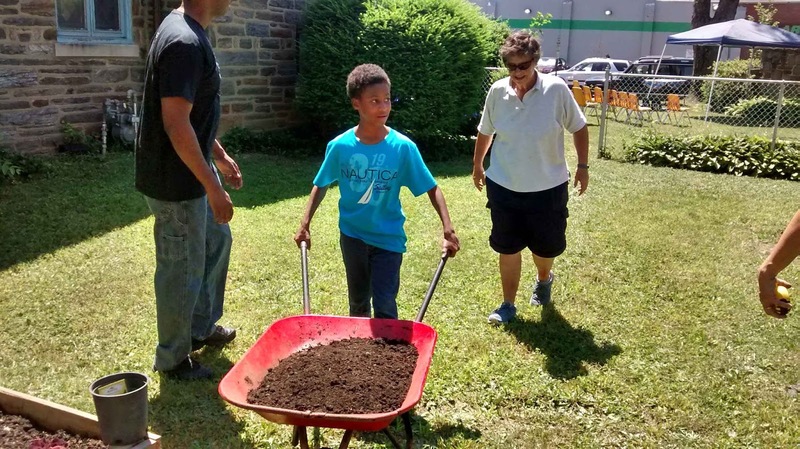 We service families in the William Penn School District (Aldan, Darby Borough, Colwyn, East Lansdowne, Lansdowne and Yeadon). 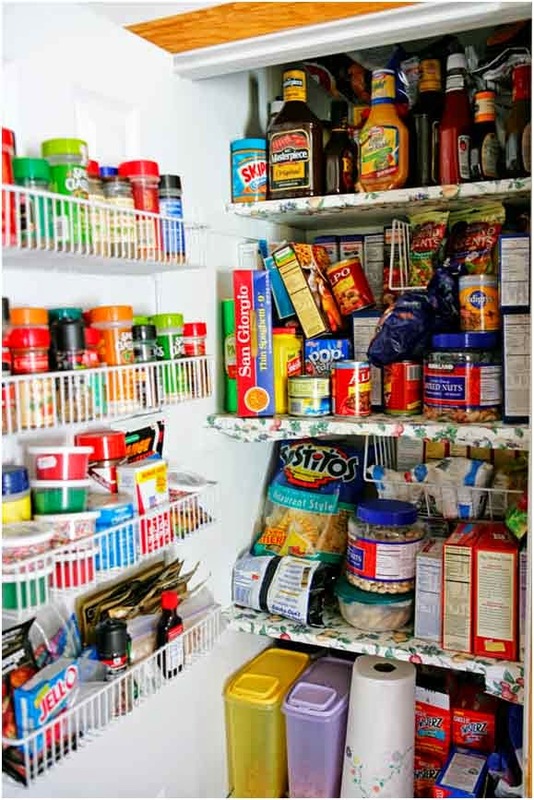 We are here to help with emergency food needs! Call us at 610-622-0800, option 4 for more information. 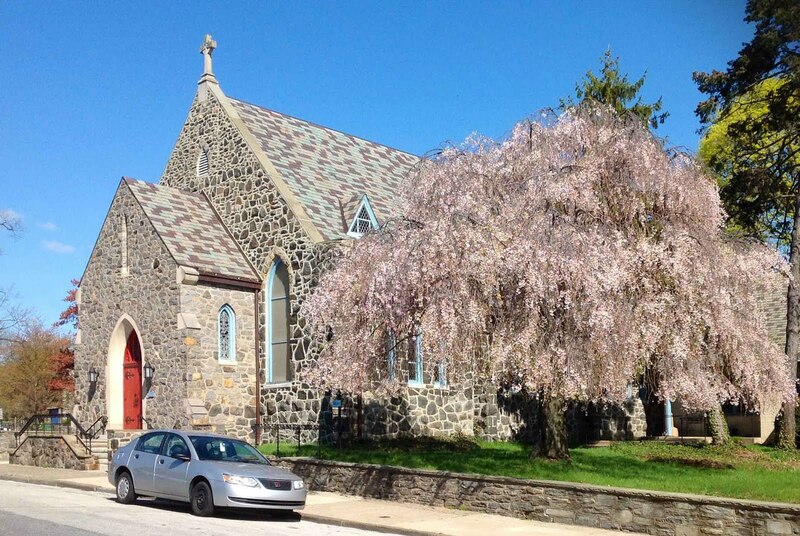 We are located at the First Presbyterian Church in Lansdowne, PA and are open on Monday and Wednesdays from 4:00-6:00p.m. This is not a walk in service so please call ahead to register as a client. Please bring proof of residency to register. You will need to provide your own transportation. Unfortunately, we cannot deliver to you. For 47 million plus American, food stamps are required to make ends meet. 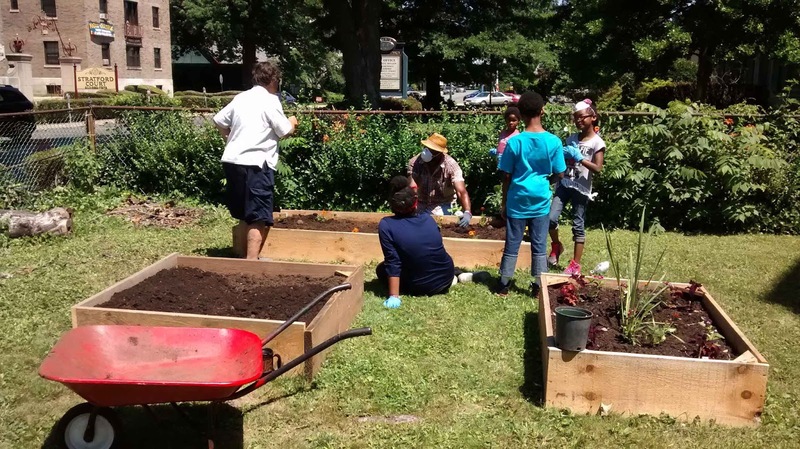 Our local food pantries work hard to try to meet the growing needs of increasingly hungry populations who are "food insecure." That means they do not get enough to eat on a daily basis. There is a free cookbook online available to help those on tight budgets eat better meals with healthier foods. This will help many to live better within tight means, which is never easy. This cookbook can be a real blessing to many. Who will you help today? This online address has changed since the original post. All You Can Eat Pancakes on Memorial Day at LBC! 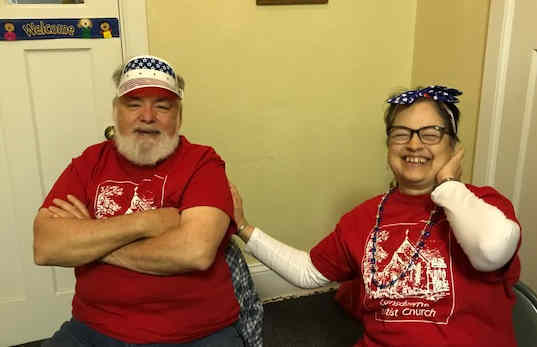 Are you going to be in Lansdowne, Pennsylvania, on Memorial Day for the parade or the 5 K run? Are you going to be hungry??? 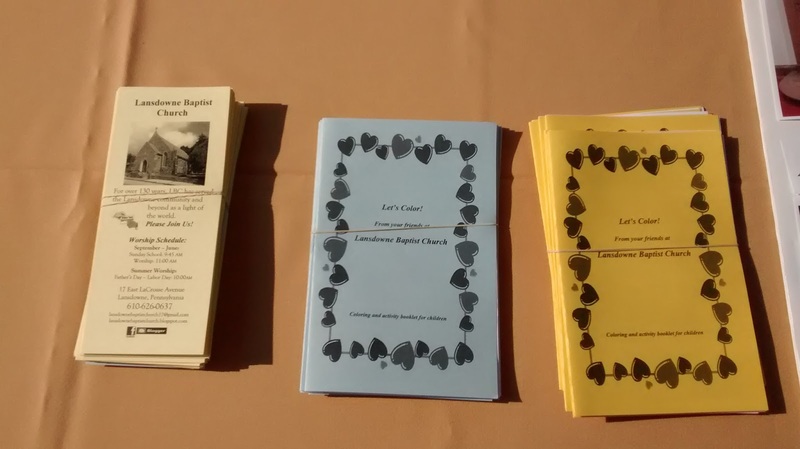 Well, Lansdowne Baptist Church's busy congregation has a deal for you! Stop by the church in the morning for all the pancakes you can eat, made by some of the most wonderful cooks in and around Lansdowne. 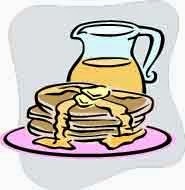 Pancakes will be served from 9:30 AM until noon. The price is right, at $7 per person, $5 for children under 12, and $20 for immediate family members. The fellowship will be are warm and sweet as the meal. You are invited. The funds collected are going to a very good cause, building up the funds for the Aaron Royal Scholarship, which benefits graduating, qualifying high school seniors in the William Penn School District. The price you pay on Memorial Day for that sweet meal will help deserving teens go to college. We look forward to seeing you Monday, May 26, Memorial Day. You are most welcome. 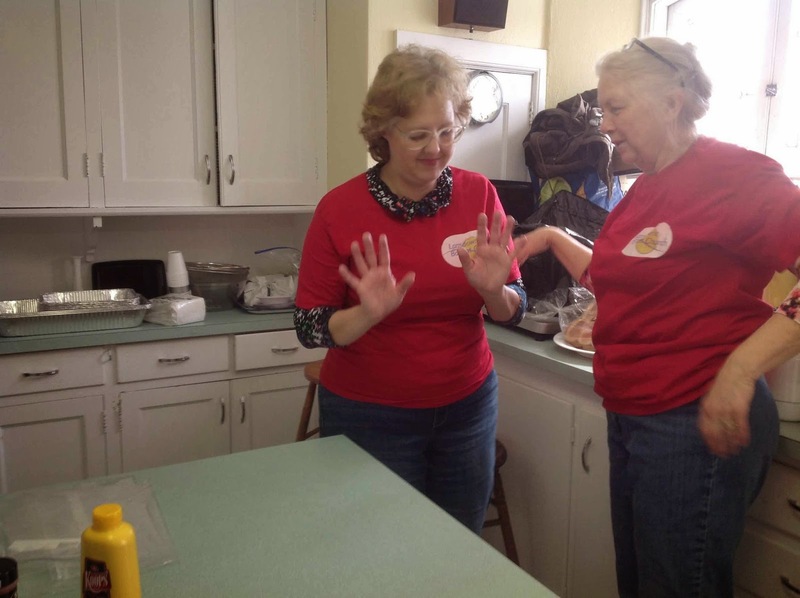 One of the many mission projects undertaken by the PBA is the Baby Manna project. This is an important mission designed to bring much needed formula and other baby products to those babies living in poverty in the Delaware Valley. Currently, there are over 12,000 babies born into poverty in the Delaware Valley every year. Most of these children are bottle fed as they must be cared for by someone other than their mothers. Costs for infant formula is high and rising. Impoverished caregivers have been forced to give hungry infants sugar water or watered down formula, which of course are poor substitutes for proper nutrition. Infant malnutrition leads to lasting and devastating impacts on children's lives. One hundred percent of donations to the Baby Manna program are used by Philabundance to purchase infant formula and baby products made available to Philabundance's member agencies and the people they serve. Have a positive impact on the lives of those who struggle to nurture their infants while struggling under the crushing impact of poverty in our region by donating to this worthy program.